Renovating your apartment or home is a big project and the transformation can be exciting but also tiring. Once your renovation is finished, there is cleaning that needs to be done. 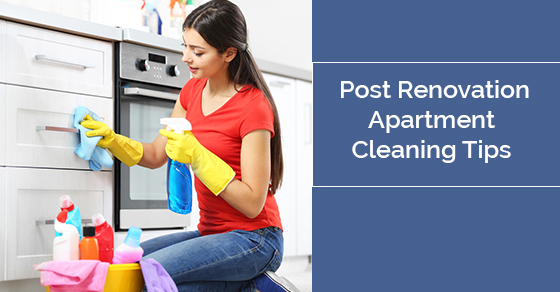 To ensure that your post-renovation cleaning goes well, here are some tips that will help. You can start by first opening the windows and let the fresh air come in. The next step is to get rid of all visible dirt. To do this, dry clean all areas first, beginning from top to bottom. Use a dry duster for countertops and shelves and use a vacuum cleaner or broom to get rid of the dust on the floor. A cleaning service may be required to get the deepest clean. The next step is to get your mop out and get rid of the dirt on the floor. Use a disinfectant and a cloth. Clean the walls, window sills, doors and door knobs. Take time and get all areas where dirt can hide. Office cleaning not only provides quality cleaning to your office but it also lifts the spirits of everyone who works in the office. Most importantly, be sure to look for stains that were left behind after construction work. Of course, if curtains or blinds were left before the transformation began, clean them off first with a sweeper attachment and then with a damp microfiber cloth. If all this cleaning sounds too much, then think about hiring a cleaning company. Cleaning companies have a staff that will come to your home and schedule a time that is convenient for you. They will clean all surfaces—floors, countertops, furniture and other items and leave your apartment shining, organized and ready for a new beginning. Their crew will come prepared to take care of your needs. They have fully personalized cleaning and maid services, are supervised, insured and bonded. Their post-renovation cleaning services include the following: cleaning all rooms and hallways, washing doors and door frames, wiping shelves, cleaning floor and baseboards and washing mirrors. Other cleaning projects are dusting all furniture, dusting and wiping shelves, removing cobwebs and fingerprints, vacuuming sofas and chairs and dusting all light fixtures and lamps. Bathrooms are also deep cleaned, as well as your kitchen. Areas and items in your kitchen that are deep cleaned, such as small and large appliances and stovetops. Other cleaning services that are provided in your kitchen are vacuuming and washing floors, washing doors, and door frames, and dusting and cleaning shelves.